DIY Biking | How bike builds, bike travel and bike life can save the world: Folding Bike Week 2013: What Happened to the Dahon Matrix? Folding Bike Week 2013: What Happened to the Dahon Matrix? Regular readers may have noticed an absence of my Dahon Matrix on this blog. The last time it was featured was on my brief ride in Annapolis, Maryland, but things had actually been going wrong for that bike much earlier - none of which was the fault of Dahon. No one else on this planet knows this, but the widely circulated and wordless post on what I did in the aftermath of the Sandy Hook shooting (called simply -20-) was supposed to have the Matrix as the star. Really, it did. I hitched up that trailer and made it more than a mile before, as the picture above shows, the right pedal just fell off. I Fred Flintstoned the bike back to the house and replaced it with the recumbent, and the little change of equipment never made it into my -20- post. I quickly discovered that the pedal itself must have been bashed or cockeyed at one point and the threads in the crank arm were just weathered into nothingness. I still have no idea how that happened. At first I replaced the crank arms/chainring with the one I had removed from the Bike Friday when that bike was getting an upgrade right before I met Stacey. It worked alright but the proximity of the big ring limited my gearing options. I soon realized I needed to replace the bottom bracket, and here the story takes a tragic turn: I took the old one out before figuring out what needed to go in. Like Wheezy the Penguin in Toy Story 2: my Matrix was shelved. In January, as you all know, I channeled the fashion-challenged, razor blade- industry destroying, inner hipster by building a single speed which took the bulk of my day-to-day commuting needs. I also worked on the kitchen project which took up most of my free time. 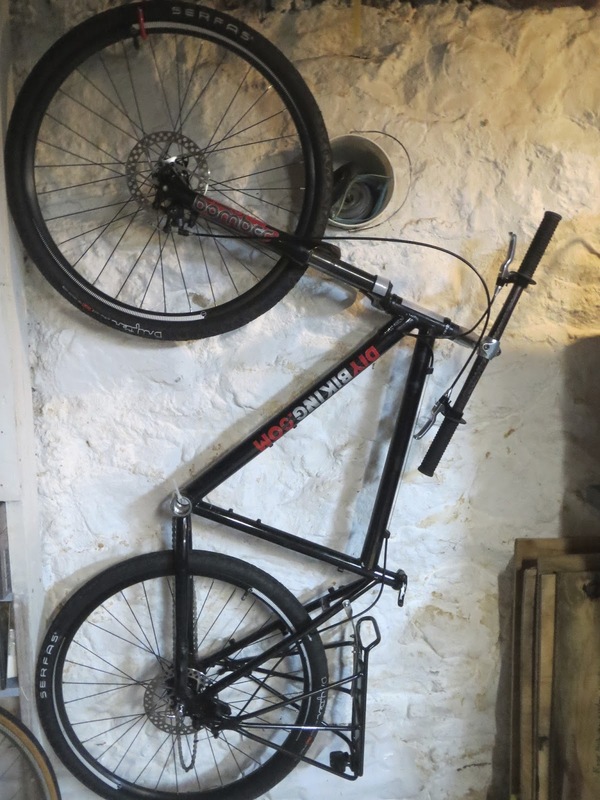 But every time I was in the workshop I'd look over at the Matrix, which was hanging unceremoniously on a hook, and that bike would look back at me accusingly. Meanwhile, the single speed, built on the wrong kind of frame, began giving me trouble. As expected, the slight stretching of the chain meant it would pop off the rings at unexpected moments, usually while I was riding either to or from work. Having to stop to put the chain back on wasn't fun, especially since I knew the problem was only going to get worse. So one day, about a week ago, I made a decision: I am not now nor have I ever been a hipster, and to that end I would cannibalize the bottom bracket from the single speed to go on the Matrix. I bought a 9-speed Shimano crank to use, and in no time I had the bottom bracket removed from the single speed and installed on the Matrix. It really is the sexually transmitted disease of bottom brackets as it is the third bike it has been on in two years. But it was wide enough to accommodate the crank, and a few twists and turns put it on the Matrix. After inflating the tires and cleaning the chain, the bike worked as though not a single day had passed. It's been to my office and back several times and has gone to the grocery store at least twice. I remembered all the things I liked about it: full size feel, solid grip and just built for city life. Whether you are returning shopping trolleys to their points of origin, taking a Metro North train to a faraway land or leading a group of nuns to an ice cream parlor, the Matrix was the right bike for the job. And the single speed took its place on the hook in the basement. But then…a letdown: I confirmed that Dahon has, in fact, discontinued the Matrix; citing 'not a lot of demand' for it. Worse still: they discontinued it before my first post about the Matrix. It's even listed on the 'archive' section of their new web site. It made my skin crawl: You archive 5th grade report cards. You archive old tax returns. You don't archive outstanding pieces of engineering greatness...but apparently Dahon does. The Dahon Guy I had met at Bike Expo New York confirmed all this, and assured me the full-suspension, 20"-wheeled Jetstream was a suitable replacement. I looked at the Jetstream page and it seems like a good bike, but it was still a letdown: part of what made (rather: MAKES) the Matrix cool is the surprise of the fold; I cannot tell you how many double-takes I get when I bring the bike on a railway platform and I fold it with those hidden hinges. The Jetstream looks like a folding bike, so the Matrix always had that Bond car quality to it. It's a bike so good that Beyonce would have surely ridden it from Brooklyn if she had the chance. So even though my Matrix is running again, I am once again riding a museum piece. Whoever designed this bike within Dahon: I thank you, I will check out your new products one of these days but I'll still stick with the Matrix, which you can see here, leaning against my discontinued Honda Element. Perhaps in comfort.